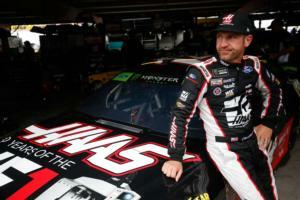 Clint Bowyer is riding high from momentum earned last weekend at Texas Motor Speedway and he hopes to combine that hot streak with a recent string of top 10 finishes at Bristol Motor Speedway to work his way into Victory Lane with a strong run at Sunday's Food City 500. Bowyer finished second at TMS Sunday in his No. 14 Stewart Haas Racing machine and will look to grab a victory this weekend at his beloved Bristol, where he's run strong in the past but hasn't found a way to seal the deal. The way he figures it, the all-concrete bullring is due a little payback. While Kyle Busch has racked up a slew of Cup Series victories at BMS - seven to be exact-- Bowyer has seemingly been within striking distance every single time. He's posted top 10 finishes in five of his last seven starts at BMS, including a 6th place finish last August and an 8th place finish during last year's Food City 500. He finished a BMS-best of 2nd in the 2017 spring race. In a year when BMS officials are going throwback with a celebration of Dale Earnhardt's first Cup Series victory in April 1979, could this be the year when a modern day throwback like Bowyer finally breaks through and gets that much sought after Gladiator Sword? "Man I like short-track racing," Bowyer said. "You're really wheeling that thing, trying to keep the grip under your tires, forward bite. Trying to keep the thing turning. Fighting the balance of the cars. Fighting your crew chief all race long because you're whining in the car, and he is tired of hearing you whine. But all those things need to come together to win that race and be successful." Bowyer, who led three laps of the race at TMS one week ago but ultimately followed winner Denny Hamlin across the finish line, is ready to keep building on that effort and he feels like Bristol could be the place for him to grab a victory that would secure him a spot in the Playoffs. "Last week in Texas was a shot in the arm for us," Bowyer said. "We were kind of down after Martinsville because we really thought we had a shot to win, or at least run top-three, and kind of shot ourselves in the foot. We struggled at Texas on Friday and Saturday, but we had a hell of a comeback on Sunday. We were the best we were all weekend during the race. That's the way you want it. My guys did a heck of a job last weekend. Bristol should be more of the same. We ran well there last time and the place kind of owes us one after August." Busch has driven his No. 18 M&M's machine to two of the last three victories here and his brother Kurt won the other one - the Night Race last August where he declared Bristol the 'Holy Grail of Short Tracks.' They will both be in the hunt for another Bristol trophy, and so will two-time season winner Hamlin and Brad Keselowski, a two-time winner this season and also a two-time Bristol winner. Others to watch include Kevin Harvick, defending series champ Joey Logano, 2017 Food City 500 winner Jimmie Johnson, Chase Elliott, Martin Truex Jr., Ryan Blaney, Ricky Stenhouse, Erik Jones, Bubba Wallace and Daniel Suarez. In addition to Sunday's Food City 500, the event also will showcase a Saturday doubleheader with the Alsco 300 NASCAR Xfinity Series race and the Zombie Auto 150 NASCAR K&N Pro Series race. On Friday, the Cup Series stars will try to break the BMS track record of 131.668 mph (Denny Hamlin, Aug. 2016) as they qualify during Bush's Beans Pole Day. Friday afternoon's Food City Family Race night, held at the track, is one of the longest running fan events on the NASCAR circuit. A ton of cash will be on the line for four NASCAR Xfinity Series regulars as they battle it out for the Dash 4 Cash bonus in the Alsco 300 on Saturday. Christopher Bell, Michael Annett, Tyler Reddick and Chase Briscoe were the top finishers last weekend at Texas Motor Speedway and should either of them win at BMS they will pocket an additional $100,000. "It's gonna be pretty cool getting to race for $100,000," said Briscoe, who drives the No. 98 machine for Stewart-Haas Racing.. "It's not every day you get to do that, so I'm looking forward to it." Cup Series regulars Ryan Preece (April) and Kyle Larson (August) won last year's Xfinity Series races at BMS, so the table is wide open for an Xfinity Series regular to take home the prize when the green flag drops at 1 p.m. In addition to the four drivers eligible for the Dash 4 Cash bonus, a strong group of Xfinity Series stars will be battling for victory including recent California winner Cole Custer, Watermelon farmer Ross Chastain, JR Motorsports veteran Justin Allgaier, JR Motorsports rookie Noah Gragson, Team Penske driver Austin Cindric, second generation driver John Hunter Nemechek and local favorite Chad Finchum, from Knoxville. Former Bristol K&N Series race winner Harrison Burton was announced yesterday as the driver of the Joe Gibbs Racing No. 18 machine and the second-generation driver will make his Xfinity Series debut on the famed all-concrete high banks. "I am very excited to have the opportunity to make my Xfinity Series debut with Joe Gibbs Racing," said Burton, son of former Cup driver Jeff Burton. "(Primary sponsor) Dex has been so supportive of me from the very beginning, and I'm honored that they will be on board with me as I start this new chapter." Burton is driving fulltime this season in the NASCAR Gander Outoors Truck Series in the No. 18 truck for Kyle Busch Motorsports. "I am so pumped to be going to a team that has had so many accomplishments, with great drivers to look up to as I continue to grow in my racing career," Burton said. "I am really grateful for this opportunity." An all-star lineup of young racing talent is entered in the Zombie Auto 150, with a green flag scheduled for Saturday at 4 p.m. Several veteran drivers of the NASCAR K&N Pro Series East division, including Ruben Garcia Jr., Brandon McReynolds, Anthony Sergi, Riley Herbst, Derek Kraus and Spencer Davis will headline the race, while a strong group of rookies will be making their first K&N starts at the World's Fastest Half-Mile. Those rookies include former NHRA Pro Stock champion Tanner Gray, Georgia short track specialist Drew Dollar, the 2018 U.S. Short Track Nationals Super Late Model winner Raphael Lessard, Max McLaughlin and Mason Diaz. A trio of ladies will also be featured in the race, including recent winner Hailie Deegan, who won earlier this year at the Las Vegas Motor Speedway dirt track. Deegan, who drives the No. 19 car for Bill McAnally, is a two-time winner in the Series and will be making her first Bristol start. Part-time NASCAR Truck Series driver Natalie Decker will drive the No. 98 car for David Gilliland Racing and Brittney Zamora, a rookie on the K&N Series circuit this year, will pilot the No. 99 machine for McAnally. During the Food City 500 weekend you'll definitely want to take advantage of so many activities to make a complete weekend of family fun, including great video entertainment provided by Colossus TV, the world's largest center-hung video screen, premium VIP experiences like the Chairman's Experience, tailgating, on-site camping, concerts, great food and beverages in the concession stands throughout the property, and so much more. And for families who want to bring the entire clan, Bristol Motor Speedway officials are making it easier than ever for kids to have an awesome experience. Kids' tickets (12 and under) are free and adult tickets are $10 for Friday's (April 5) Bush's Beans Pole Day. On Saturday (April 6), kids' tickets are free and adult tickets start at $35 for the Alsco 300 NASCAR Xfinity Series race and the Zombie Auto 150 NASCAR K&N Series event. On Sunday (April 7) adult tickets start at $55 for the Food City 500 and kids' tickets are $10. For all races, each child must have a physical ticket in hand to enter the gates. The Bristol Motor Speedway ticket office is the only authorized location that can produce the free kids' tickets. To purchase tickets to the Food City 500, please call 423-BRISTOL or buy them online at www.BRISTOLTIX.com. Fierce clashes and heart-stopping finishes are hallmarks of the most popular race in NASCAR, and if history’s any indication The Bass Pro Shops NRA Night Race is guaranteed to entertain guests with yet another epic battle inside the Last Great Colosseum. © 2019 Speedway Motorsports, Inc.